Anyway, yes, I am still planning to update the design here, although it is not likely to include either a preponderance of pink OR the liberal application of googly eyes. I have to leave something for you, Annemarie! You’ll probably still see plenty of green (shocking, I know), but I want something a little more “fun” than the current green and gray. So, in spite of the sweltering heat last week, I spent part of last Wednesday with the fabulous Yorkie and her equally-fabulous hubby and son at the National Zoo. We had a complete blast, and laughed our way through most of the zoo, particularly the small animal building. She and I discovered a talent for narrating the lives of Golden Lion-Headed Tamarins. They have such cute wise little old man faces, and I just loved watching them run around. I did get some pictures of the day, which are posted on Flickr. 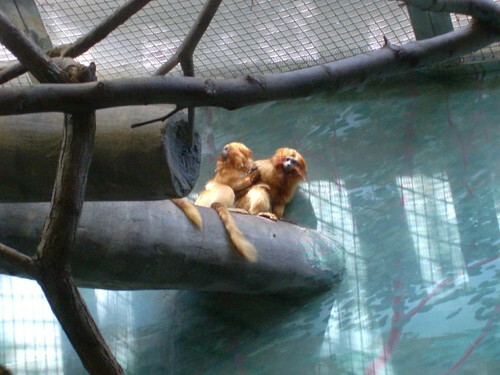 Click on the Tamarins to see them. And Yorkie, I’d just like to point out that I didn’t post the mask picture ON my blog. Also, I have caved to the ubiquitousness that is the Ravelympics. I really enjoyed doing the Knitting Olympics in 2006, and since I will be watching obnoxious amounts of Olympics coverage anyway, well, why not? I’m doing a crochet project this time around – Edie Eckman’s Santa Fe Shawl from the cover of the Summer Interweave Crochet. Mine will be in Elann.com’s Lara in shades of burgundy and pink lightish red. I will, of course, be keeping the blog updated with the status on it, so you’ll see it take shape. Other than that, just doing some reorganization and general cleaning around here. Finally got the scary, scary gutters cleaned out this weekend (YAY! ), and we’re almost ready to build the actual porch walls and roof, since we’ve got suckers fabulous, wonderful friends bribed with beer and hot tub time willing to help out of the goodness of their hearts in a couple of weeks. Again, pictures will be forthcoming. 5 comments to Yeah, yeah. he he he! I’ve been feeling so guilty because I haven’t been blogging or reading blogs lately. I’m trying to get back into the groove and yours is one of the first i read! You make me feel better about loosing my mojo. That’ll be a pretty shawl! At least you are working on one project. Um..I had to go all wild hair up..well you know and like 7 small projects..
Ravelympics calls to me too but I’m not sure…I’ve got until Fri. to decide. I understand the waning interest in the blog, I’m feeling the same these days. Since your project is crochet, you’ll probably finish in record time.